« vEco integrated with UN-GRASP’s new website! 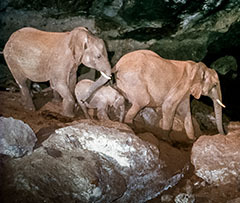 Lunch-Break vEcoLive: Meet the Salt-Mining Elephants of Kitum Cave, Kenya! To mark the occasion of World Elephant Day, 2015, please join us on your lunch break when Ian Redmond will provide a vEcoLive tour of Kitum Cave in Mt Elgon National Park, Kenya. Bring your own sandwiches and head to live.vecotourism.org to accompany Ian as he narrates, in real-time, a five-location expedition from the Park’s front gates into the depths of Kitum Cave where elephants have been mining salt with their tusks for generations. vEcoLive is our ground-breaking experimental platform that allows virtual ecotourists to share a group tour experience, chat with fellow tourists and ask the tour guide questions, and hear live audio commentary from an expert host. Please note that vEcoLive currently requires a PC (running Internet Explorer, FireFox, or Chrome) or a Mac (running Chrome, NOT Safari) and Adobe Flash Player installed. Mobile devices (smartphones and tablets) are not supported at this time. Is the showing happening? When I click through there is a blank green screen other than on the right where it asks for my name. I put that in and nothing. I was there at Kitum when Ian filmed this so I want to see it!!!! I can hear Ian’s voice but see no image. Is there a problem? I tried watching the live presentation but could not see any images even though I could hear Ian talking about them. Drats! we just missed it – encore please.Suzie and me here – but off to dentist at 3pst.